I haven't reviewed many, but I went through a phase where I drank lots of protein shakes and smoothies. I was always on a quest to find some that satisfied, but I honestly still don't have a brand I'd recommend highly. CalNaturale is part of California Natural Products, a natural foods company. 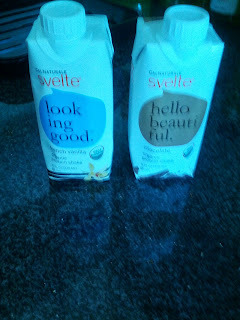 The CalNaturale label makes two product lines: Svelte Protein Shakes and ... Wine. I've never tried their wine. The shakes are all dairy-free and gluten-free, soy based, and fairly low sugar, sweetened with Stevia. When I was on a liquids diet, I tried out many, many brands of protein drinks, and these were some of my favorites. I wouldn't really pick one up now, as I kinda want nothing to do with smoothies and shakes after months of being required to only have liquids, but if I needed to again, I'd probably start with these. Not a strong recommendation, but decent. "Just Your Style", aka, Spiced Chai. Tasting notes: This was by far my favorite. Nice spicing, it almost reminded me of a pumpkin pie spiced drink. Maybe October is just getting to me :) It also wasn't too sweet, and didn't have the fake taste to it that other varieties did. Would get this again. You may have noticed that I really like baked goods. I tend to have fairly high standards, and generally only consume baked goods that are baked fresh, considering even day old pastries to be useless. So why on earth would I try the pre-packaged baked goods from Walgreens? Well, before Google Shopping Express launched, I was helping test the service. I was tasked with making lots of small orders from the then fairly limited number of merchants. Walgreens was one. After I got my fill of dishwasher detergent, hand soap, shampoo, lotion, and other responsible household items, I decided to have more fun. I saw they offered baked goods, so I figured they were worth trying out. I'm sure if I had seen them in person at the store I would have never picked them up. But online, they looked ... decent? Looks can be deceiving :) There really is no reason to get any of these, but I did enjoy the fact that I could order a donut online and have it delivered to my doorstep just a few hours later! While I don't recommend Walgreens baked goods, if you live in the Bay Area, I do really recommend Google Shopping Express, particularly now that they have expanded the merchant selection. It has made me consider 2 day Amazon Prime way, way too slow! The description was pretty simple: "blasting with blueberry goodness." Well, this was about what you'd expect from a packaged muffin with a long shelf life. Since it was in a wrapper it was kinda gummy on top. It was moist, but not in a fresh way. The most stand out thing about the muffin was how very sweet it was. It was much more of a blueberry cake than a muffin. 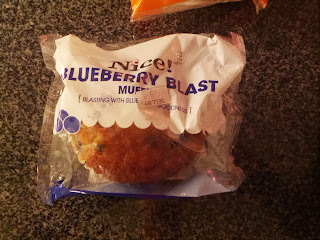 I'm all for sweets in the morning, but this was indistinguishable from a sweet pound cake, just shaped like a muffin. Besides being sweet, the base had nothing going on. No tang, no spicing, nothing. I wasn't entirely surprised when I looked at the ingredients to see sugar as the first ingredient, even before flour. It was indeed loaded with blueberries; I was impressed with how many, but they were little tiny wild blueberries, which I never prefer. It reminded me a bit of the Panera blueberry muffin in that way. The nutrition stats were pretty standard for this sort of baked good - 400 calories, 30g sugar, 22g fat. Of course, the recommended serving size is 1/2 muffin, which always makes me laugh, because who eats half a muffin? It was better once I heated it up, and got it a bit crispy, which removed the strange gummy aspect to it. I also then slathered it in butter. Salvageable, but certainly not something I'd ever get again. I randomly really crave donuts. It always makes me laugh when it happens, because I'll go months without thinking about donuts at all, and then suddenly, I need one, stat! This time, the craving came a day after trying a cronut. The cronut did not change my world, and instead, just left me craving a simple, glazed donut. I've tried many from assorted places around town, but really haven't found any that I love. So, when I had the chance to get the one from Walgreens, I figured it was worth a try. 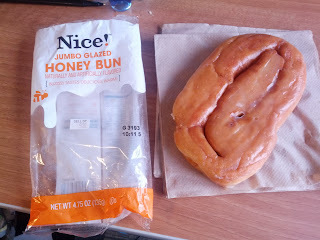 They make two versions of the "jumbo" honey buns, glazed or iced. I went for the glazed since it more resembled a classic donut. It looked even worse than the muffin, super gummy. I tried a bite at room temperature, and was met with immediate dismay. It was pretty gross. Indeed very gummy, kinda soggy, absolutely nothing good about it. I am notorious for serving most of my baked goods warm, but it has never occurred to me to warm up a donut, even though I love them hot and fresh. Interestingly, even Walgreens recommend that you serve this heated up. The packaging is filled with statements like "tastes great warm!" and "microwave for 5-10 seconds!" So I did, not expecting much change. Well, technically, I put it in the toaster oven for a few minutes instead of the microwave, because, ew, microwaves. And ... it transformed! I was shocked. Sure, I'm a huge advocate of warming things up, and my co-workers are endlessly amused by the fact that I warm up desserts, oatmeal bars, etc, all day long. I know warm baked goods are better than cold. But this was a magic transformation, very similar to the cinnamon roll from 7-Eleven (which I totally recommend!). It was soft, the glaze melted a bit, and it was a warm, sugary, delight. Was it a fresh baked donut? No. Was it downright awful for you? Um, yes. It had a crazy long shelf life. It had a slew of preservatives. It was horrible for you, in just about every way. This honey bun clocks in at ... 600 calories! 35 grams of fat. 27 grams sugar. ZOMG. I can't say that I recommend this exactly, but I did quite honestly enjoy it once I had it warm. If there was another one, I'd eat it. That's all I'm sayin'. 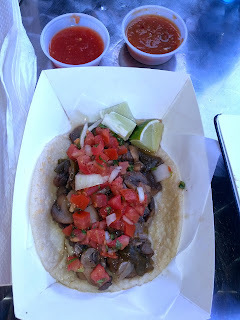 I was really excited when I heard about Toma, a Mexican restaurant in the Marina that opened this past year. I really do enjoy mexican cuisine, but most casual places use lower end meats and products than I'm really comfortable consuming. 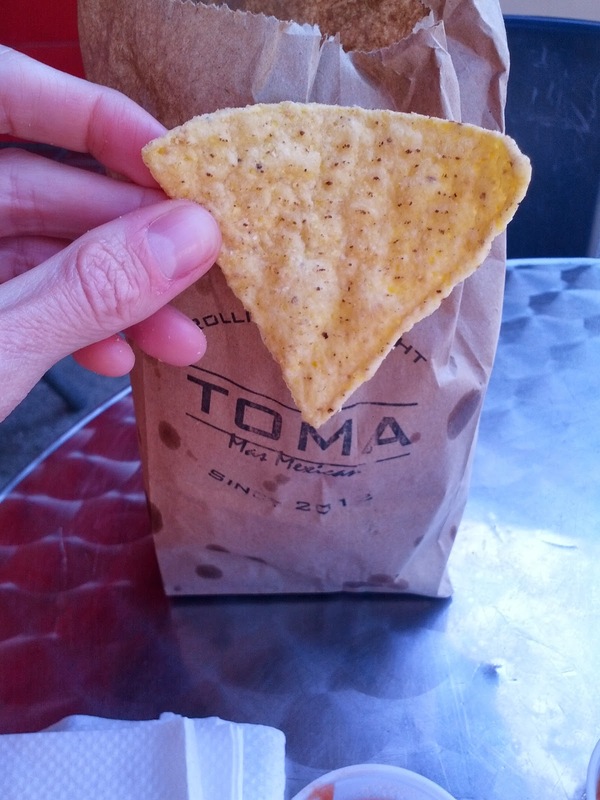 But Toma boasts that all of their meats come from Golden Gate Meats. Everything is free range, no hormones, etc. The recipes have been handed down from their grandparents. The tortillas are even made to order! They have multiple vegetarian choices, and even gluten-free options. It sounded very promising, although Yelp! reviews were quite mixed. I eagerly stopped in one afternoon when I saw that they were offering a $5 credit if you paid with Paypal. It was a hot afternoon, and I really wanted a refreshing horchata, a taco, and some salty chips! Unfortunately, they did not have any horchata, even though the menu listed it, instead, a single agua fresca was available (along with standard canned and bottled drinks). Strike one, but understandable. The space is tiny, with a couple counter seats along the window, and two small tables outside. A small salsa bar completes the space. Most people seem to take their food to go. The staff weren't exactly friendly. They kinda glared at me while I decided what to order. Paying with Paypal worked like a charm though, I really am loving it. No awkward scanning of QR codes like LevelUp. I'm very curious to see how their adoption goes, as it is only available in a handful of places in SF so far. Anyway, the food sadly wasn't very good. I won't be going back to Toma. I'm not a vegetarian, but I don't really care for chicken, pork, or beef, so I was excited to see that they had two different veggie options. I went for the championes, a mix of "grilled mushrooms, roasted chile poblano, and onions", since the roasted poblanos sounded fantastic (my other choice was grilled yellow squash, zucchini, tomatoes, and onions, which also sounded good), topped with pico de gallo. My taco was delivered to me a few minutes later. It looked a bit difficult to eat, so I grabbed a fork to try out the filling first. The filling was almost entirely mushrooms. I was surprised by what they were. Since the menu said grilled mushrooms, so I expected perhaps grilled portabellos. Or, um, at least something grilled. These were small mushrooms, super slimy, and honestly seemed like they came out of a jar. Like pizza topping mushrooms. I'm guessing they had just been cooked down extensively. Unremarkable, no flavor, and certainly not grilled. As for the poblanos that I was excited for, my entire taco contained exactly two small pieces. Again, "roasted"? I don't think so. There was also a small amount of cooked down onion. But mostly, it was just a very large pile of mushroom. Very, very, watery mushroom. There was a pool of liquid in my box within the first moment I picked it up. Impossible to eat. The wateriness completely ruined the tortilla. It might have indeed been a fresh, made-to-order tortilla. It did have a nice corn flavor. But, it was a very soggy mess. Not remotely crisp, and it really didn't seem like it had been griddled long enough, as it was kinda doughy. But maybe that was just all the liquid. It was topped with a simple pico de gallo, tomatoes/onions/cilantro. Not particularly interesting nor flavorful. Served with a slice of lime. I didn't even want more than a few bites of this taco. As I mentioned, there was a salsa bar, with four different salsas, more chunks of lime, and an onion/cilantro mix. I tried all four salsas, and all were incredibly watery. I guess that is the theme here. The most mild one honestly seemed just like watered down tomato sauce. One had a bit of heat. None were labelled, so you had to try all of them in order to figure out which were spicy. Incredibly boring salsas. I brought home some chips and salsa for Ojan, who loves chips and salsas, but he didn't want any of these either. At $2.95, the price for the taco was fine, and would be considered quite good for a meat one (they are all the same price), but meh, not even worth that. Since the tacos do not come with chips, I splurged for a side of chips. They came in a cute little paper bag. They were cold. Very standard chips. I was expecting something more freshly made since that seemed to be the idea they were going for at Toma, but these could have been from any bag in a grocery store. Good portion for $1, but not really worth getting, particularly given that the salsas were so weak that there was nothing to do with them. Burger King has always had a larger selection of sides than McDonalds, but they've now taken another leap, and offer not one, not two, but THREE different types of fries: sweet potato, regular, and their latest offering, dubbed Satisfries ... the healthy, yet still satisfying, fries. The marketing behind them is genius, boasting that they contain 40% less fat and 30% fewer calories. I assumed that they were comparing against their own fries. They aren't. They are comparing against McDonalds! The numbers aren't nearly as impressive when you compare against their own versions, but given that they use the same oil and fryers, I guess it is impressive. They developed a coating that somehow magically absorbs less oil. But, (spoiler alert! ), they didn't live up to their name. My fries were hot and fresh. I give them credit for that. Unlike the standard fries, they are crinkle cut. I've never really liked crinkle cut fries, and my family always ate tons of frozen crinkle cut fries when I was a kid. These reminded me of those exactly, not just in look, but also in taste. They tasted like cardboard. The outside was crispy, but the inside was just mush. It didn't resemble potato in any way. 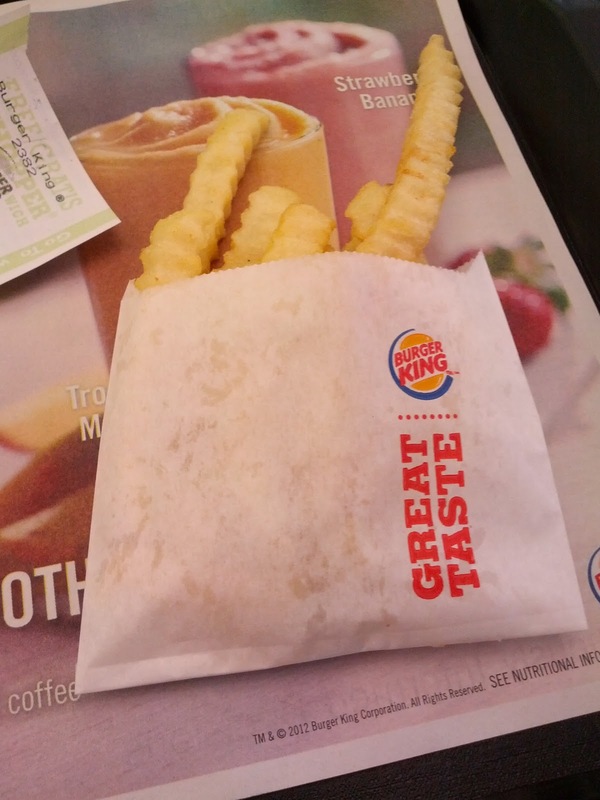 Burger King claims the fries are cut from whole potatoes, but I'm pretty skeptical. They weren't salted well either.